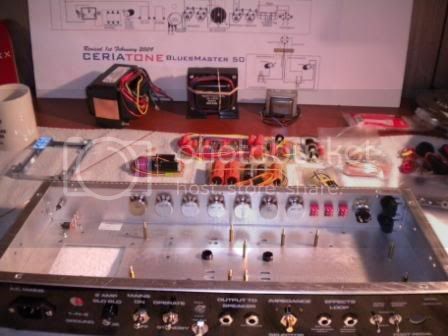 Bluesmaster50 - BUILD RESURRECTED AGAIN>>AND AGAIN>>AND ONE LAST TIME!!! The BM50 is out for delivery, should be here sometime today! The BM50 arrived on schedule! But I'm not ready yet. I still need to order a few things and read more! Aaaaahhhh, that picture brings back nice memories. 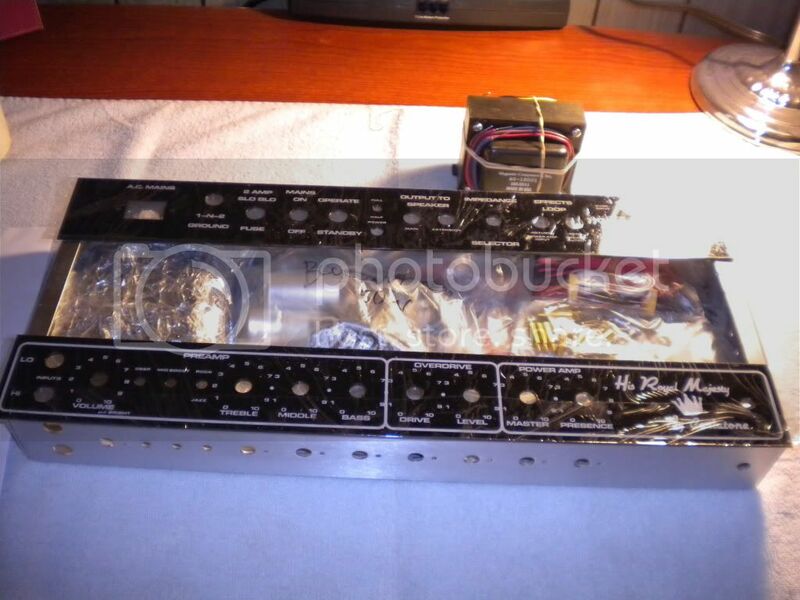 Enjoy your project... you're gonna love this amp. Well I started installing the hardware. Everything went good I think. I tell ya, it's very crowded in that chasis! I'll be doing the heater wires next. In the the top left corner of the pic right under the filament indicator is a component numbered 7812 with 3 prongs. Are those 3 prongs soldered to the back of that bracket? I'm assuming they are but they barely touch so I wasn't sure. Yes that's a voltage regulator. I soldered the pins in the bottom holes... some people don't even screw down this regulator against the chassis. I've noticed that some people use the red/black wire or the black/white wire for the heater wires. Does it matter which ones to use? I used black/white cause it's easier to do the job properly. I ordered this kit well over a year ago as a first build and I must admit that I quickly became intimidated and overwhelmed by the complexity of this build. I've been slowly nudging my way back and I've finally decided to start this build again. I'm confident that I can do this build, I'm just going to need alot of help. So here I go with a couple questions right off the bat. I've been studying the layout and noticed at the bottom that it's been revised. This may be a stupid question but can someone show me where on the layout have these changes been made and where can I order these parts from in the states? If you plan on making a simple grab and go amp in a combo cab with a 1x12, I highly recommend adding a built in D-lator point to point . 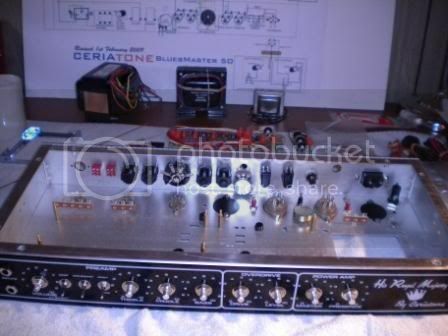 Do the research @ the amp garage, add the extra 2 nodes for B+ right via 2x450V 22uf caps on the pwr supply board, convert one of the octal tube covers to a 12ax7 hole, put the PI tube there and the D-lator tube would go where the PI should go, and use Mini 12mm (12mm is really small, they can be found @ Small Bear electronics) 250kA pots for Send/Return levels controls above the send and return jacks. It only cost's about about $40-55 in parts and will be a money saver if you had planned on getting an external d-lator. If u do it now it should b no problem, although if you wait till the amp is finished in the standard config, it will be a cram. Stop searching for tone, INVENT IT! +1 on that. 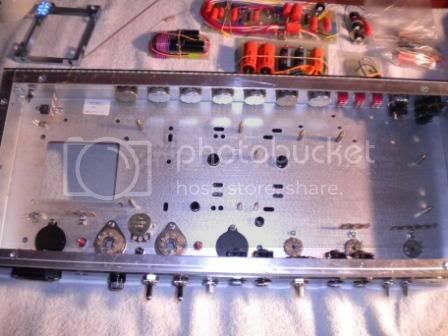 I had the chassis out today changing a couple of things and scoping out a place for an onboard c-lator ( I love mine but hate having to carry it) and a place to put a resistor and cap for my planned switchable cathode/fixed bias mod, and nixed both plans. It's tight in there!! I suggest you contact Nik to ask what components were changed in the revision so that atleast if you follow the new layout you will know which components are substituted. Another suggestion would be to print a giant size layout at kinkos and then tape with scotch tape each component in its respective place. It helps in doing the parts count as well as once you start soldering you wont have to stop and meter and or read color code each step! The revision changes will most likely become apparent as well!